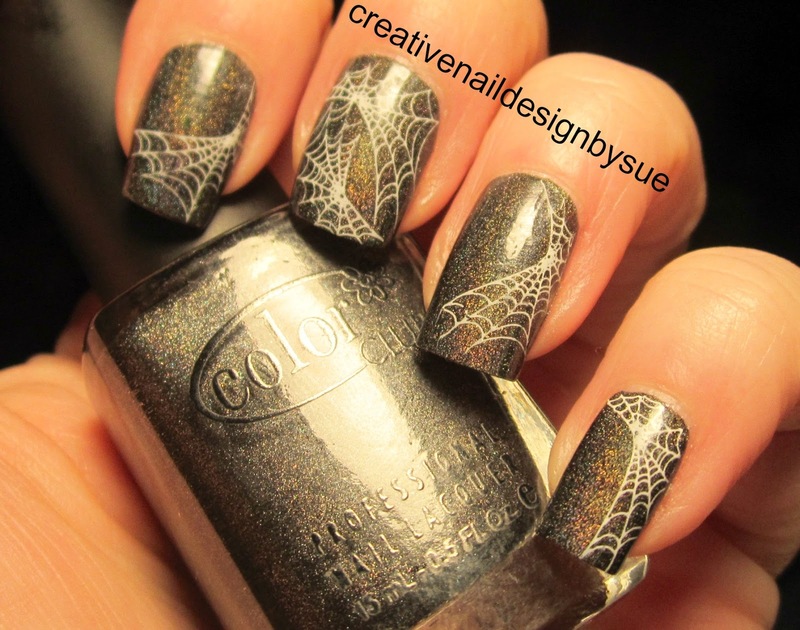 This Halloween design was a request from my controller Sue. She showed me a picture from the Internet of spiderwebs on a black background. I liked the image but thought it needed more depth so I broke out my Color Club Revvolution. It is an amazing holographic polish that looks black, grey and sometimes even a little green in certain lights. I topped it off with BM13 and plain old Konad White. I took pictures in various indoor lighting since there was no sun...AGAIN!!!! That looks really good. I need to start using my Color Clubs more! The base holographic polish is beautiful and the stamping is perfect for it! Nice job!!! I love the background color!!! Love this! I need to start getting some Color Clubs.